Editing clips of video means a lot of time rendering them out. While this goes on, I have time to make a few other things happen. One of them is clearing out some of my junk drawers and putting it up to a more accessible position. Among the stuff I grabbed a long time ago was something called Hacker Photos, which was someone’s attempt to gather “the face of the underground”. What he mostly did was capture everybody who has both a newspaper article and a DEFCON badge in their scrapbooks. Well, whatever works. 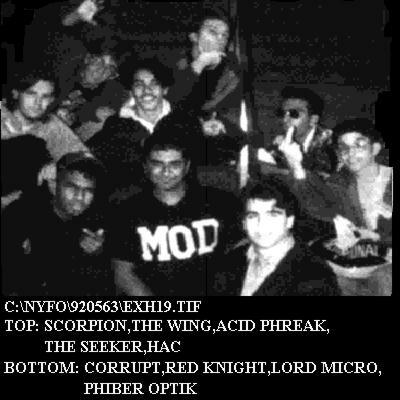 Some of these people are friends and the attempt to capture “the underground” is an appreciable act. So here that site is again. The date of it is 2001 but I’m sure I caught it a little later than that. The “photos” seem to be culled from screengrabs of video, newspaper articles, and various scanned photographs taken over a range of about 10 years. As time goes on, this functions more as a lovable album than a real “rogues’ gallery”. The addition of some of the canonical UNIX and Internet pioneers is a nice touch as well. I’m sure some people in these photos are unhappy about this. Well, sorry. Someone thought you were a hacker, once. Now you’re awesome. I assume anyone who judges you based on these photos is not really your friend or not worth working for anyway. Hang loose. Funny how those sorts of things work. I’m sure there are people dying to get off of that page, and people wishing they were on it.